The invention of the screw dates back to around the third century BC. Although they are commonly used, they are also commonly misused or simply underused. Since I use a large variety of screws on a daily basis, I figured I would give a brief explanation of the many ways they can improve the quality of your work and reduce frustration. GRK manufactures the best, commonly available screws on the market. In many ways, they have reinvented the screw! All of the screws pictured here are GRK’s. While I do love them, they are pricey. One of the time consuming parts of trim work is shimming your piece (stair treads and risers, door jambs, casing, etc.) You can often ease this process by using large-headed screws to bring your framing to the desired plane before placing the trim in place. When using “shim screws” it’s best to screw or nail the trim near the underlying shim screws. This prevents the screws or nails from pulling the trim past the plane set by your shim screws. Use large-headed, shim screws in pairs every 16″-24″. Then, attach your extension jambs using narrow, trim screws in matching pairs. Use two screws in each stringer, front and back, on each step. Find your desired height and set one screw to that height. Adjust the other screws the the desired height using a slow-turning drill or a hand screwdriver. When setting your treads, use liberal amounts of polyurethane construction adhesive to bridge the small gap between the stringers and the underside of your treads. If the gap is over an 1/8″ inch, apply adhesive and an appropriately sized shim or block to decrease the gap to an 1/8″ or less before gluing your treads down. (Careful placement of your screws should enable you to hide ALL of your tread fasteners! There are a TON of uses for “shim screws” in nearly every area of home building and repair such as tile installation, floor leveling, exterior trim, and archways. 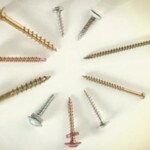 Thinking of screws as a “pushing” as well as a “pulling” fastener will lead you to find uses for them nearly everywhere! Reverse head screws are a gift to us all! The reverse threads get pulled into the material when screwing in; allowing you to sink the head. If the material is pulled in too far, simply reverse the screw and the threads near the head will “push” the material away while leaving the head recessed! This is great for getting trim and extension jambs, flush and in plane with each other. 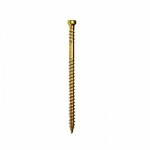 Note: Reverse head screws should not be used to adjust the level of load bearing material such as stairs or sub-floors. While the reverse threads provide a fair amount of strength, there is a reason they are not used for framing! Next time you are at the lumber yard, check out the variety of screws and choose the best screw for the job! Previous post: Is Improper Ventilation Destroying Your Roof? Next post: Is Your Home Wasting Energy?